Today I will be talking about the main G units featured for all clans in the upcoming FC2015. Just a brief explanation, I won't be talking about the Cray Elementals, as that's for another article altogether. Since all clans are featured, this will be a rather long article, so bear with me. Now then, let's begin, shall we? 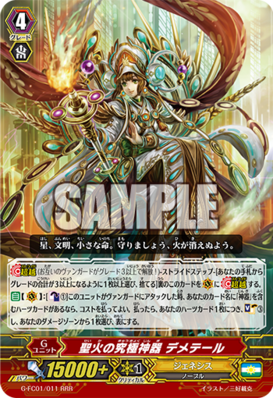 [AUTO](VC):[Counter Blast (1) & Choose a face down card named "Holy Dragon, Religious Soul Saver" from your G zone, and turn it face up] When this unit is placed on (VC), if you have a heart card with "Blaster" in its card name, you may pay the cost. If you do, choose up to three of your units, and they get [Power]+5000 until end of turn. Then, if the number of cards in your soul with "Blaster" in its card name is two or more, this unit gets [Critical]+1 until end of turn. The obvious deck choice to run this with would be MLB(Majesty Lord Blaster). On your G3 turn, make sure you get Blaster Dark, and Blaster Blade into the soul with MLB's skill. Next turn, stride this card for a free crit pressure and high-powered rear guard columns. Make sure you have at least 3 RGs to maximize this effect; 2 in your left column, 1 on the right at least, vice-versa. You can throw a RG behind your VG, but your opponent is likely to just kanzen, so you'd best save your hand, unless you know for sure he does not have a kanzen in hand. 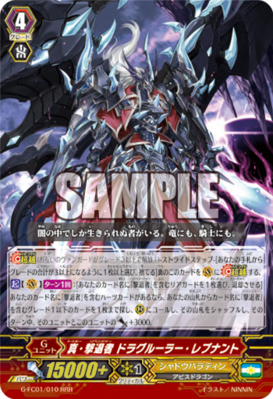 [ACT](VC)[1/Turn]:[Choose a face down card named "Deity of the Evening Moon, Tsukuyomi" from your G zone, and turn it face up & Choose a card with "Tsukuyomi" in its card name from your hand, and put it into your soul] If you have a heart card with "Tsukuyomi" in its card name, look at five cards from the top of your deck, search for up to two cards from among them, put them into your hand, and put the rest on the bottom of your deck in any order. This stride is kinda lackluster for a GR, but pretty good nonetheless. Since it doesn't use any counterblast, you can save the CB for Full moon Tsukuyomi's skill. This stride will ensure that your g1 and g2 Tsukuyomi's do not become dead fodder in your hand. Granting a net +1, not very good, but this helps reach your stack even faster. 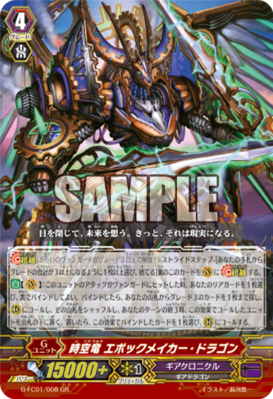 ACT](VC)[1/Turn]:[Counter Blast (1) & Choose a face down card named "Purgation Lion Emperor, Mithril Ezel" from your G zone, and turn it face up] If you have a heart card with "Ezel" in its card name, unlock all of your locked cards, look at five cards from the top of your deck, search for up to one card from among them, call it to (RC), shuffle your deck, and increase that unit and this unit's [Power] by the original [Power] of the unit called with this effect until end of turn. With the return of Link Joker and Glendios(and his stride) this card can be a major killjoy for your opponent when he's about to World End you next turn. It doesn't take as much counterblast and soulblast as Ezel Scissors, so you can keep unlocking just for the trolls. The advantage of being able to superior call something slightly more specific than what Blond Ezel can give is good. Even if your opponent is not a Link Joker, you still get the +1 from the new rear-guard, and the extra power for increased pressure on your turn. 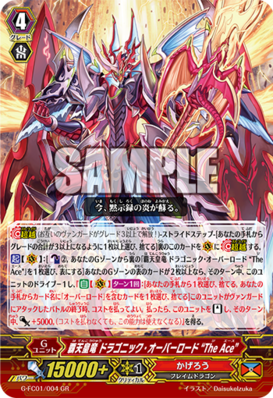 Supreme Heavenly Emperor, Dragonic Overlord "The Ace"
[ACT](VC):[Counter Blast (2) & Choose a face down card named "Supreme Heavenly Emperor Dragon, Dragonic Overlord "The Ace"" from your G zone, and turn it face-up] If the number of face up cards in your G zone is two or more, until end of turn, this unit gets drive-1 and "[AUTO](VC)[1/Turn]:[Choose a card from your hand, and discard it & Choose a card with "Overlord" in its card name from your hand, and discard it] At the end of the battle that this unit attacked a vanguard, you may pay the cost. If you do, [Stand] this unit, and this unit gets [Power]+5000 until end of turn. (Even if you do not pay the cost, this ability cannot be used for the rest of that turn)". I see a lot of problems with this unit. The counterblast cost is 1. Imagine using this in a DOTX or DOTR deck. Spend 2 counterblast on this, and what have you left to restand with your boss G3? Another problem is the discard cost. In any Overlord deck, you have to already discard a G3 for stride, then you need to have another Overlord in hand. Since all Overlords a G3s, this may be a problem in all Overlord decks, and WILL be a problem in a DOTX deck. Both DOTE and DOTX require a persona blast to activate their skills. If you throw one of them from your hand, that's 1 less chance to pull off a restand with DOTE or a burn with DOTX. The way I see it, the best part about this card is the high power restand, and the additional +5K after restand. Other than that, not so good. Kind like Dragonic Overlord "The Hype". Haters gonna hate on me, but this is how I see this card. 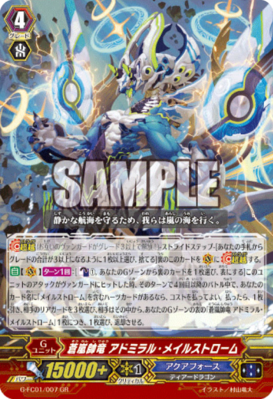 [ACT](VC)[1/Turn]:[Counter Blast (1) & Soul Blast (1) & Choose a face down card from your G zone, and turn it face up] If you have a heart card with "Big Bang Knuckle" in its name, until end of turn, this unit gets "[CONT](VC):When this unit would choose a unit to attack, choose up to three of your opponent's units for each of your heart cards instead, and this unit battles all of the chosen units in one attack. 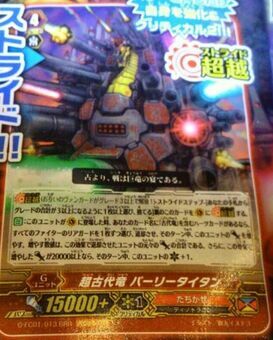 ", and this unit gets [Power]+5000 for each face up "True Brawler, Big Bang Knuckle Turbo" in your G zone. This is so good. Just being in Legion mode ensures you can hit the whole field, and kill all your opponent's rear guards in one shot. Having 2 Big Bang Slash Busters in your left and right column would make for immense attacking power, as if your Vanguard didn't have that already. The consistency is just soooo good. Once you've used up all 4 of this in your G Zone, you can just stick with your Legioned Big Bang Knuckle Buster and whack for high numbers and pressure. With this, your opponent can only attack with his Vanguard or waste resources trying to build a rear-guard presence. Bye-bye Aqua Force. 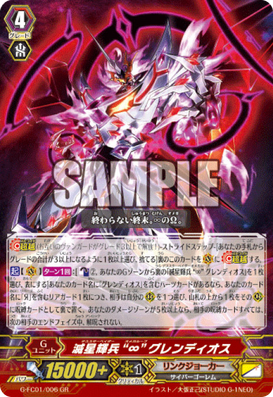 [ACT](VC)[1/Turn]: [Counter Blast (2) & Choose a face-down card named "Death Star-Vader, "Omega Loop" Glendios" from your G Zone, and turn it face-up] If you have a heart with "Glendios" in its card name, your opponent chooses one of his or her (RC) for each of your rear-guards with "Я" in its card name, and puts the top card of his or her deck into that (RC) face down as a locked card. Then if the number of cards in your damage zone is five or more, all your opponent's locked cards cannot be unlocked during his or her next end phase. Although this card sets up for your World End, the problem is that all your Reverse units from other clans can't attack, since they are no longer considered to be Link Joker units. You'll be screwed over by one heal, and then your opponent can just whack a rear-guard with his Vanguard. Another problem is that you might not have enough counterblast left after using Magnet Hollow's skills and maybe some others you might have, depending on deck build. In short, this card looks good on the surface, and would be good, if it just wasn't so circumstantial. 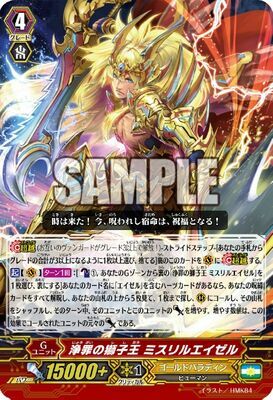 [AUTO](VC)[1/Turn]:[Counter Blast (1) & Choose a face down card from your G zone, and turn it face up] When this unit's attack hits a vanguard, if it is the fourth battle of that turn or more, and you have a heart card with "Maelstrom" in its card name, you may pay the cost. If you do, draw a card, choose three of your opponent's rear-guards, your opponent chooses one from them for each face up "Blue Storm Master Dragon, Admiral Maelstrom" in your G zone, and retires them. Obviously, Aqua Force can very well achieve a fourth attack with the Vanguard. In this situation, your opponent will either retire 1 or 3 of their rear-guards from the skill. The only issue here is thatthe skill is an on-hit effect. This can be seen not as a problem, but as an advantage which would force shield out of your opponent before you use Glory Maelstrom or Reverse Maelstrom's skill. This way, the deck becomes more pressure-centric, and it would be meant to outlast your opponent but whittling down their hand until they have nothing left. [AUTO](VC):When this unit's attack hits a vanguard, you may choose one of your rear-guards, and bind it face up. If you do, search your deck for up to one grade 3 card, call it to (RC), shuffle your deck, and at the end of your turn, put the unit called with this effect on the bottom of your deck. If you put a card on the bottom of your deck this way, choose a card bound with this effect from your bind zone, and call it to (RC). This card basically allows for you to get a fourth attack in one turn, not accounting for stand triggers. Again, the issue/advantage is that this is an on-hit effect. Your opponent can either choose to no guard and risk taking around 3 damage(including 1 crit trigger) or waste shield guarding this, and be open to your Ragnaclock's crit later in the game. This effect was not really meant to go off most of the time, but this card acts as a pressure unit in the deck. 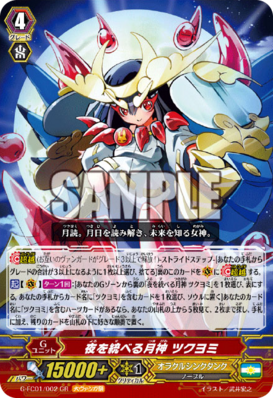 [ACT](VC)[1/Turn]:[Counter Blast (1)] If you have a heart card with "Celestial" in its card name, put the top card of your deck into your damage zone, choose a face up card from your damage zone, and call it to (RC). Then, if you have a face up card in your damage zone with the same name as a card in your hearts, the unit called with this effect gets [Power]+5000 until end of turn. This card is one of the good cards from this set, as it works with any of the Celestial bosses in Angel Feather(except maybe the FC2014 card). 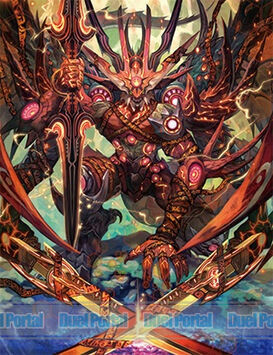 The best card to run this with would be the Celestial Legion, considering its ability to create huge-powered columns. For old school, you can run this with Zerachiel or Ramiel Reverse to build your field for their limit break to go off next turn. [ACT](VC)[1/Turn]:[Choose one of your rear-guards with "Revenger" in its card name, and retire it] If you have a heart card with "Revenger" in its card name, search your deck for up to one grade 1 or less card with "Revenger" in its card name, call it to (RC), shuffle your deck, that unit and this unit get [Power]+3000 until end of turn. As the name suggests, it's best to run this card with Dragruler to create columns harder to guard while your opponent is already at 5 damage thanks to Dragruler's skill. The best way to abuse the ability is to call something with Mana, then kill it with this skill and summon either a Blaster Dark or Masquerade. A so-so card, you can run it with any Shadow Paladin Revenger deck, although it doesn't exactly generate any pluses. [AUTO](VC):[Counter Blast (1)] When this unit attacks a vanguard, if you have a heart card with "Regalia" in its card name, you may pay the cost. If you do, for each of your heart cards, Soul Charge (3), choose a card from your damage zone, and turn it face up. Simple, but great. There's several ways to use this card. 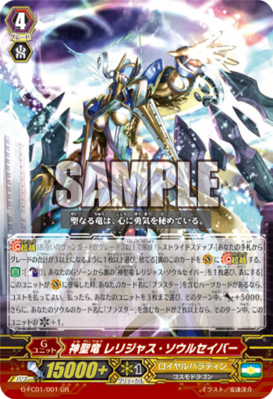 You can ride Angelica then stride this, so you can use pure angel's secondary skill to draw one card and still be able to break ride next turn. Even if you soul charge triggers this way, you can soul blast it out with the break ride. You can also use this to refill your soul after using CEO Yggdrasil's skill. If your Vanguard is in Legion when you stride this, it's a instant 6 soul for you, allowing you to use Yggdrasil again next turn for more pressure. [AUTO](VC):[Counter Blast (2)] When this unit attacks a vanguard, you may pay the cost. If you do, choose one of your opponent's rear-guards, bind it face up, your opponent chooses a card from his or her hand, and binds it face down. At the end of that turn, if you have a heart card with "Shura Stealth Dragon" in its card name, your opponent puts the cards bound with this effect into his or her drop zone, if you do not have, your opponent puts the cards bound with this effect into his or her hand. This G unit works with any of the current Nubatama bosses, even the break ride, since they all have Shura Stealth Dragon in the name. You can choose a pesky rear-guard from your opponent's field, and get rid of it by the end of your turn(I'm looking at Aqua Force and Nova Grapplers). And while they are allowed to choose which card from hand to bind, it's likely they'll have to throw some shield or an important card, allowing higher chances for your attacks to get through. This is the kind of good support Nubatama's been waiting for for so long. 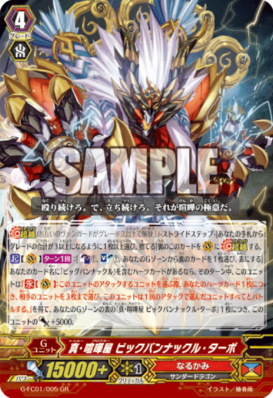 [AUTO]:When this unit placed on (VC), if you have a heart card with "Ancient Dragon" in its card name, choose a rear-guard of all fighters, retire them, and increase this unit's [Power] by the sum of the original [Power] of the units retired with this effect until end of turn. Then, if the [Power] increased with this effect is 20000 or more, this unit gets [Critical]+1 until end of turn. Translation: you and your opponent retire 1 rear-guard each, and if the total power of those 2 units is 20K or more, this unit gets +1 crit. It seems good, it's hard to get that extra critical. One will have to retire a 11K rear-guard, and the other a 9K rear-guard. Obviously your opponent wouldn't want you getting that extra crit, so he'll choose a G1 with about 7K power. The only surefire way to make sure you get that crit is in a tag match, where all 4 players will have to retire 1. In normal matches, the main purpose of this card is to force your opponent to retire their rear-guards, and you can keep yours by choosing Tyrannobite or the G1 version to retire, then revive them with their counterblast skill. This card is meant to work in a deck with Tyrannoquake and/or Tyrannolegend to keep up the pressure with high-powered attacks and easy-to-get crits.